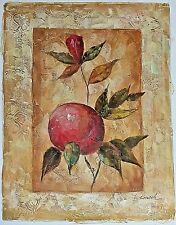 Original painting on paper. It shows schoolchildren from Japan or China at a springtime sports festival playing tug-of-war. Colorful and vibrant! Matted in black and red with foam board on the back. Pati passed away in 2013 leaving her beautiful legacy of art. She was born in London England into a family of accomplished artists. She moved to the US in 1952. Pati's continuous endeavor to capture and preserve the tranquility, beauty and aura of astute vision for painting and sculpture is the essence of her life. SUBJECT: Little Victorian Girl in red dress and hat, roses, basket of violets, flowers, floral. TITLE: May Flowers. ACTUAL PRINT LOOKS MUCH NICER THAN DIGITAL PICTURE IMAGE. PRINT SIZE (includes border): 8-7/8"x14-1/2". 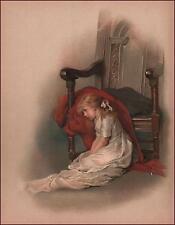 Original antique chromolithograph published in "Grannys Wonderful Chair" 1891. This chromolithograph is in excellent condition and isNOT A REPRODUCTION OR REPRINT. Chinese Folk Art Silhouettes Paper Cut 100% Handmade. The paper-cut design selects material from popular traditional opera, folk story, the character, the animal, the scene and so on. As its artistic and rich appeal, paper-cut is widely popular among Chinese people. Hearts and Flowers. 8 X 10" Original Print. 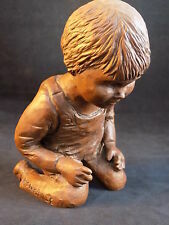 Malcolm Moran Signed Bronze Sculpture Boy Holding Big red Balloon 1960 - 1970 . MALCOM MORAN BRASS SCULPTURE! Boy holding a big red balloon there’s a few that are similar but not exactly. It’s a great price for this beautiful sculpturedepicting a little boy being pulled away by a big red balloon he is holding. Published in "Boys and Girls Book Shelf" 1910. This is an authentic antique print in excellent condition, NOT A REPRODUCTION. Walt Disney Mickey Mouse Serigraph FINE ART PRINT. SUBMIT YOUR BEST OFFER! 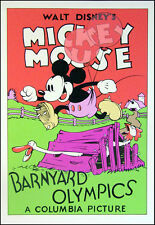 "The Mickey Mouse-Barnyard Olympics". FREE Trial ! Big sister helping her mother by carrying the baby so she can get her work done. But baby is very heavy. Antique chromolithograph published in 1886. Painting is a Personal Preference Exclusive. It is signed “J. (or T.) Smith” in the lower-right corner, and serial numbered O2455-2369360 9. Image itself is about 16.5” x 12.5”. It is signed on the bottom of the black base. Great condition. Make Supersized Seem Small. Lucien P. Moretti, #4 P. 48, SN Un Sac de Billes ORIGINAL COLOR LITHOGRAPH, OBO! Illustrations made for the book "Un Sac de Billes". Un Sac de Billes is a Second World War autobiographical novel by the French Jewish author Joesph Joffo. by Lucien Philippe Moretti. Moretti is never without his drawing pad, always capturing interesting characters and faces. Winner receivesan original signed and dated English School red crayon (or colored pencil) portrait of a young boy by F.W. Felix. The painting is signed and dated 1920 in the lower left corner, seen magnified in picture 4. This is a lovely behind the scenes portrait of life in Hawaii. We often see the hanging leis for sale, but we not the ones who make them like this little girl. Wores intentionally portrays the girl unsmiling. Abel Goubaud, Editor. Artists are E. Caillaud and Jules David. Fashion Plate - Paris. Shows woman with 6 girl children. This particular fashion plate is a little rarer because it shows children's fashions. Finished Framed Cross Stitch Art, Praying Kids "Bless Us Lord Through The Night"
Praying Kids at Bedside. Two children, boy and girl in pajamas with puppy praying beside bed. "Bless Us Lord Through The Night, Keep Us Safely in Your Sight". Print in good condition with no tears or holes.